Do you want to get more traffic to your blog? Are you tired of doing extensive research, writing in-depth articles, hitting the publish button, sharing to a variety of social channels and still not getting any of the attention all your hard work deserves? In a sense these are timeless and true. You should be telling stories in your blog posts. You should be amicable and approachable in your blog posts. And of course you should promote them on social media like Twitter, Facebook, & Pinterest, to name only a few. But blogging has gotten so much more complex and competitive now that so many businesses and individuals are doing it. So how are you going to get traffic to your blog? In what follows we are going to walk through the process above in 18 steps. Spend the time upfront to do in-depth research into your niche. This always starts with a simple Google query, “top 10 [keyword] blogs,” “top 25 [keyword] blogs,” “best [keyword] blogs,” etc. You should also visit sites like Alltop.com and Technorati to discover major content hubs. From this quick example we can identify two things: 1) Social Media Examiner is probably a top blog itself, and we’ve now got at least 10 blogs to manually crawl. This one is also specifically for 2014; so we can look through 2013 and find even more top blogs to explore. Before we do anything else, go download the Scraper chrome extension which is probably the greatest tool invented since fire. Rather than waste time manually copying and pasting this list into a Google Doc, right click the elements you want to scrape and the tool will grab them for you and automatically create a spreadsheet in Google docs. Next you can use BuzzSumo to quickly identify successful content from each of these domains. What you need to take note of here is what type of content is getting shared and where it is getting shared. Are blog posts getting shared? Videos? Infographics? Export this information to Excel so you can usefully segment the information. BuzzSumo is a great way to not only find wildly successful content, but to also discover the people who are publishing the successful content. Moreover, this content marketing tool shows the people who are sharing this content. These are people you want to make note of, since they were important to the article’s social success. From your BuzzSumo export, visit the top 5 or 10 articles from each site, and make a note of the author. Create a third tab in your initial Google Doc and add the author’s name, twitter handle, and the popular piece of content. When going through this process, share the article with your own audience and include the author in the tweet. Make a note of the date you shared it, otherwise you will probably forget. If you are faced with an overwhelming initial list (this post got over 4k shares on Twitter alone), you can try filtering down to bloggers and influencers. This will usually provide you with a much more manageable data set. Further qualify your influencer list by targeting prominent voices within your space that are actually going to respond to you. BuzzSumo makes this easy, allowing you to sort by reply ratio (highlighted by the second red box; the firs is the number of followers). Now, since we want to be able to manipulate this data and come back to it we either have to export it to Excel or get it to a Google Doc. In this instance it is best to get the data into a Google Doc because the Excel export gives you an ID number and not a user name, and doesn’t include the twitter bio, making your export far less actionable. Thankfully, you downloaded the Scraper chrome extension and don’t have to spend hours manually copying and pasting information from the BuzzSumo website into a Google spreadsheet. 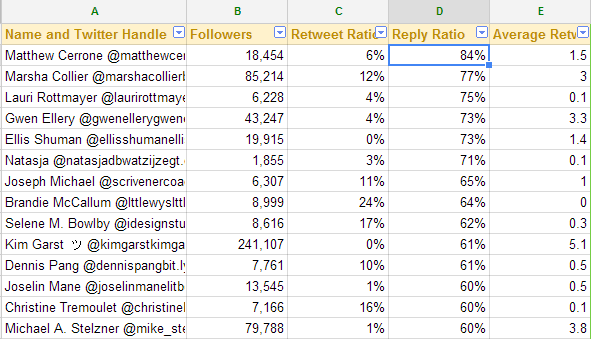 Sort by Reply Ratio, and check column A (“Name and Twitter Handle”)to make sure the person is going to be interested in your content. Column A will contain the person’s name, twitter handle, and twitter bio, where the user’s interests and affiliations often appear. While finding popular influencers is extremely important, you should also seek out individuals who are active and in the process of growing their following. Taking the niche by storm is much more invigorating and worthwhile if you are doing it and helping others along the way. 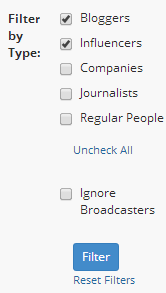 For this, you want to find people who have followings comparable to your own. You can use BuzzSumo to find people with follower counts similar to your own by filtering the “Followers” column in your spreadsheet. AJ Kohn notes in his discussion of the ridiculous power of blog commenting that it is necessary to capture the attention of prominent content creators (influencers); and the surprising place to find where they hang out and win their attention is….on their blog! Since you have a qualified list of great blogs, begin to participate in the discussions they are having. Absolutely do not drop a link in any of your initial comments, even if it is relevant to the post. What you should really be doing in the comments section is to adding to the conversation in a meaningful way. If people enjoy what you have to say, and find your input to be informative, they will make their way over to your blog either by clicking the link from the comment, or by Googleing you, which you want to start happening. Again, don’t wait until you need to enlist the help of others to promote your content to interact with them. Start forming relationships after you have identified the popular blogs and influencers in your space. At this point we have a clear sense of the major content hubs, what is successful on those hubs, the individual authors who are creating content, influential users, and users with social profiles and aspirations similar to our own. Since I have covered how to create enormously successful content utilizing BuzzSumo in a previous post, you can refer to that if you are looking for grand scale social wins that might crash your server. What we are concerned with here is one way to quickly & tactically create content that will drive traffic to your blog. If you are in an industry with a lot of content being created, take advantage of the extant body of work. Using SEMRush you can uncover enough ideas to populate your content calendar for the next 100 years, even with a team of inspired writers. 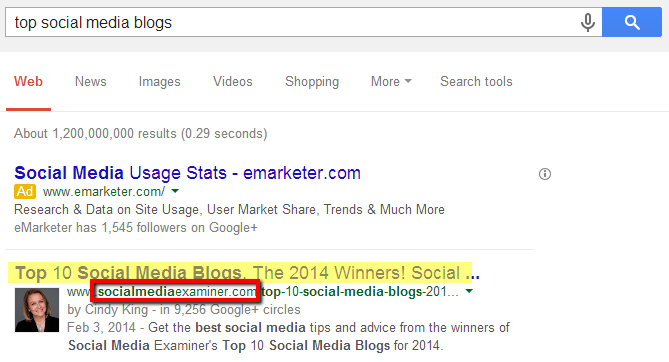 I have used Social Media Examiner in the example below, which is currently ranking for over 12,000 organic keywords. Data this size is fun to look at, but essentially useless. Export the full report into Excel so you can begin to constructively manipulate the data. I’ve done a simple filter for “twitter” and reduced the size of this data set from 10,000 to 547 individual posts, their keyword volume, their current & previous rank, and, importantly, the URL ranking for this phrase. Now it is time to put on your tweed jacket and create an editorial calendar. But aren’t business going to have questions about their design? Absolutely. Aren’t they going to need examples of other brands successfully utilizing twitter as an advertising tool? Absolutely. That’s our next editorial topic, all scraped from SocialMediaExaminer.com thanks to SEMRush. That’s 13 blog posts created from just a few minutes of skimming, and you have a clear sense of where to link each one and which anchor text to use. Moreover, these have been thematically constructed from the start saving you the time of retroactively creating the structure to link them all together. The other benefit of this, thanks to SEMRush, is that you can quickly jump out to the actual article and look for ways to usefully improve upon what was written. You also have an author to contact, and if you enjoyed the blog post, at least send them a tweet. So, not only do you have 13 blog ideas, you might also have up to at least 13 new individuals to start a conversation with in a natural, unforced manner. If you are in a niche that isn’t cranking out enormous amounts of content (yes, they exist), or if you are looking to blaze a new trail in your industry, you can’t rely on what everyone has already said or what keywords everyone else is already ranking for. You’re going to have to do keyword research all on your own. In order to get the most out of your keyword research strategy, you are going to have to explore keywords through a few different lenses, and use keyword tools in an innovative and thought-provoking fashion. First and foremost, you need to do keyword research based upon informational topics, something many digital marketers were talking about in late 2013. Once you have a topic identified, then go looking for keywords to flesh out that topic, using traditional search volume and difficulty to identify opportunities. Once you have a topic and a group of keywords, create blog posts that will be thematically relevant to one another and gently guide visitors through to each post, much like we did in the SEMRush example. This makes your site much more sticky than if you had simply composed blog posts based loosely upon relevance (we don’t have a page focused on this keyword, time to crank out another soulless blog post) and keyword opportunity (its low competition!). Ideally, you should also map these blog posts to your digital marketing funnel so in addition to traffic you are getting conversions. 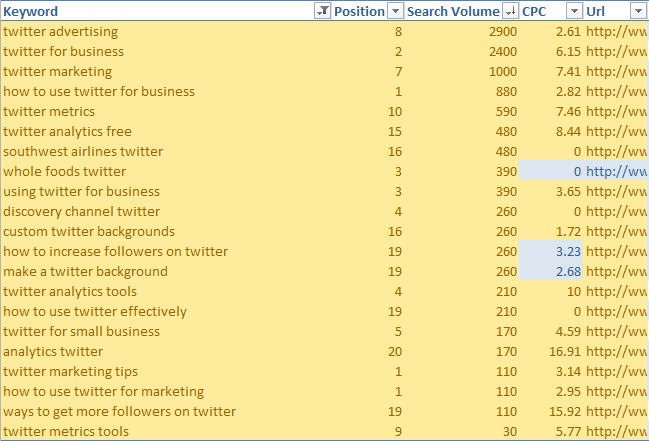 What tools should you use for the most effective keyword research? There are hundreds to choose from, so for now keep it simple. Google Trends helps to make sure that the content you are producing is centered around topics that are increasingly being discussed, and helps you avoid topics whose time has come and gone. Importantly, Google Trends also unveils seasonality in search habits allowing you to optimize your content creation towards specific times of the year. Unsure of where to take your publishing schedule? Use Google’s related searches to unveil ancillary content ideas. When using ubersuggest for your keyword research, I’ve found the most luck for discovering long-tail search queries with low volume and low difficulty. If you discover search volume opportunities, then you need to reference that with the Moz keyword difficulty checker to ensure your effort is going to be worthwhile. 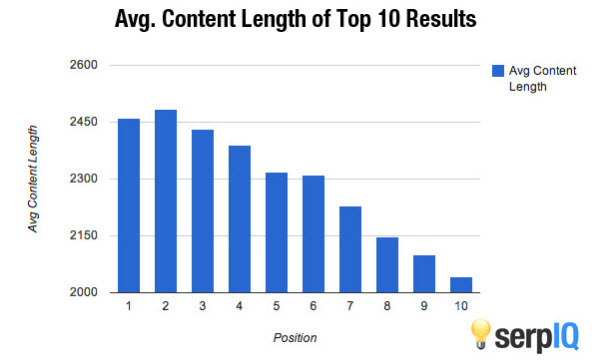 I’ve stopped at ‘e’ and already have tons of additional ideas that I didn’t have from the SEMRush research. Scrape your list (it’s in the right margin with a small button “Get”) and then head over to the Google Keyword planner to see if any of these are worth pursuing. 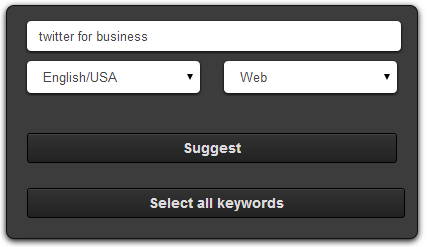 We’ve come a long way at this point, moving from extensive industry mapping to a round of thorough keyword research. We’ve come up with not one blog post, but a group of blog posts. But before we hit publish, we want to make sure we know the ideal time to hit publish. 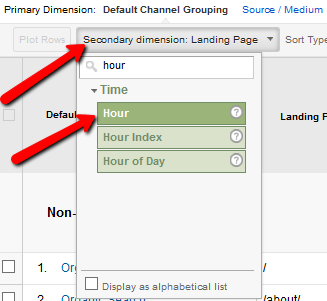 Use Google Analytics to identify peak times when visitors are landing on your site. Posting at these times gives you a great chance not only for viewers to see your latest post, but also a great chance for increased social shares which, in turn, will increase traffic to your blog. 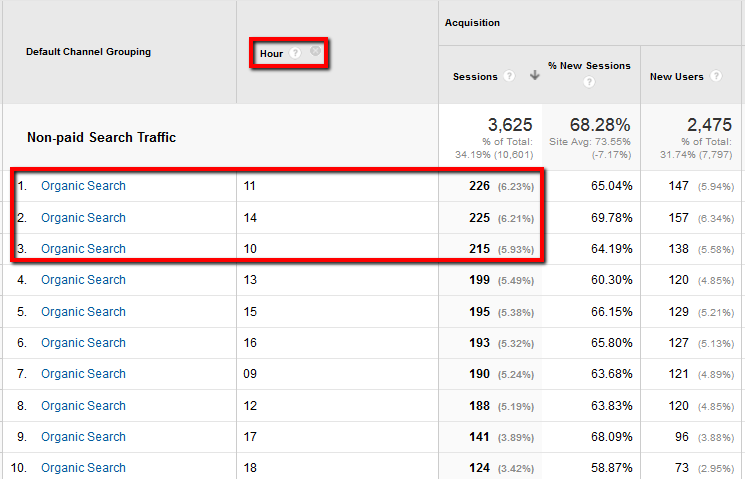 In Google Analytics, go to All Traffic and select the channel you want to review. Under Secondary Dimension, simply type “Hour” and it will show you which hour of the day has the most visits. I like to start this by framing it within a 6 month view, or even a year. For this particular blog, we can see that if we want to maximize its exposure for Organic search traffic, it would be prudent to have the post appear at 10am eastern, 11am eastern, and 2pm eastern. You can also use this method to check your referral traffic frome social media, and center your posting around those times. 8 Don’t Chase Headlines. Create Cornerstone Content that Moves People. Like many suggestions, this comes with a caveat. If you are in a news-dependent niche, or a bit of news is highly relevant to your brand, then yes, you absolutely should create a piece of timely content. But the best blogs aren’t just continually newsjacking or creating tactical content based on the absence of a keyword featuring on a targeted page. The best blogs are creating cornerstone content to drive more and more traffic to them. Cornerstone content creates the very foundation of your site. Cornerstone content fills a gap and gives other people a reason to link to you and to talk about your brand. Remember when you went to BuzzSumo and identified the popular posts that were getting shared across social media? Now is the time to revisit this research and create your post, either filling a content gap or expanding upon the research or entertainment value of popular content from your BuzzSumo pulls. A great blog is going to have incredible photos, and this is what is beginning to separate the incredible blogs from everyone else in 2014 (‘twas ever so). Even more important than great pictures, blogs that invest in indelible imagery are going to be the ones that reap tons of traffic. Don’t be a blog that is afraid to invest in art. To be clear, great photos don’t have to be stunning works of art. If you can afford to put stunning works of art in your blog posts, however, I wouldn’t shy away from it. If you can’t afford high quality imagery, you can nevertheless afford artwork that breaks up your content and makes it visually stimulating, while also differentiating your content from everyone else in your niche. An incredible free tool to help with this, Canva, allows you to easily create piquant images. If no one clicks your headline, traffic to your blog is never going to increase. So what you need to do is create magnetic headlines. There has also been a flurry of research around the most popular words in viral headlines. Spend the time on these posts and learn to use the information within and your blog traffic is going to increase. Your headlines should be sensitive to the medium in which you want to promote your content on. For example, many of the headlines that turn out to be the most successful at driving large amounts of traffic to a site are created for Facebook. Not Google. If you are hoping to increase organic traffic, your ability to utilize some of the tactics that work on social media are going to be restricted. Almost all bloggers probably realize that by now they should be optimizing their posts by including the keyword in the H1 and H2 tag. But don’t simply include the keyword in your H1 & H2 tag. Spend the time to create headlines within your copy that pique your reader’s curiosity and encourage them to continue reading. This is a simple tip, and while it is actually fairly difficult to execute, you will be rewarded with organic traffic and engaged visitors who will promote your content and help boost traffic to your site. The benefits of writing long-form content are numerous and have been routinely eulogized across the Internet. Indeed, the CRO expert Peep Laja used a long-form content strategy to grow his blog to 50,000 visits in one month. Over at Wordstream’s informative blog, @Dan Shewan has added the most recent entry in the ever growing chorus of voices expounding the virtues of long-form compositions. Creating long-form or in-depth content allows you to demonstrate your passion and expertise for a particular subject, increasing your chance of creating content that will emotionally resonate with your audience. It also allows you to attempt to make a meaningful and sustained contribution to your niche, and introduce new ideas to your audience. What does this mean, tactically? That more readers will return to your site, and that they will be much more engaged. They might actually read all of the in-depth article you spent so much time researching and writing! Writing long-form content also allows you to naturally weave in more synonyms of keywords you are trying to tactically rank for. One important member of your audience who can’t always understand your long form content is Google. Thankfully, Google has created a way for you utilize Schema.org markup in order to help its search engine robot understand your in-depth content, and reward your blog with extra organic traffic. If you use WordPress, Virante has created a plugin to help make it easier to include Schema.org mark up in your long form posts. If you don’t have a WordPress site, or don’t want to add another plugin, you can follow the webmaster tools guidelines for the “In-Depth articles” feature. Of course you know to link from one blog post to another. You also know that when you link from one post to another, to link thematically related posts and to also link to service or product pages to drive visitors deeper into your site. But do you know how many internal links your competitor has to their same page? Do you know the anchor text they are using? Drop the URL of their page into Open Site Explorer, filter for internal only, and passing link equity. Make sure you are looking at links pointing only to the target page, and not the entire domain. Export this list to CSV and do some quick research. The quick takeaway here is that if I had been hanging out on Moz.com more, I could have a massive list of people who might be interested in this post and could easily reach out to them. Sadly, I haven’t been loitering on Moz! If we look at the site ranking in the second position (goinswriter.com/more-blog-traffic/) and perform the same procedure, we can see there are only 9 internal links with the anchor text “traffic,” “blog traffic,” “growing your blog traffic,” and the titular “How to Get More Traffic to your Blog and Keep it There.” After building up additional domain authority, if I can create between 9 and 227 (hah) internal links, I have a fair shot at least scraping my way to the 2nd or 3rd place with a solid internal linking strategy. Lastly, if you are creating cornerstone content, those pages should be amassing link equity, which, in turn, you can use to internally link to other important content. By doing this, you can increase the authority of pages you want to bring more traffic to your blog. Everyone knows you need to be posting your latest blog article to twitter. But what’s the point of tweeting if no one is ever going to see it? Rather than fire it off into the deafening wall of sound, spend the extra time to discover the best times to promote your content. Check to see when your audience is active using Followerwonk. 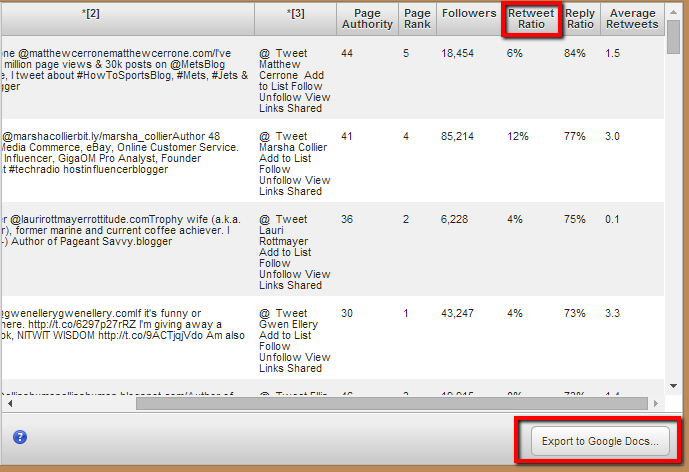 You can do this by visiting the “Analyze Followers” tab, and entering your own twitter handle. 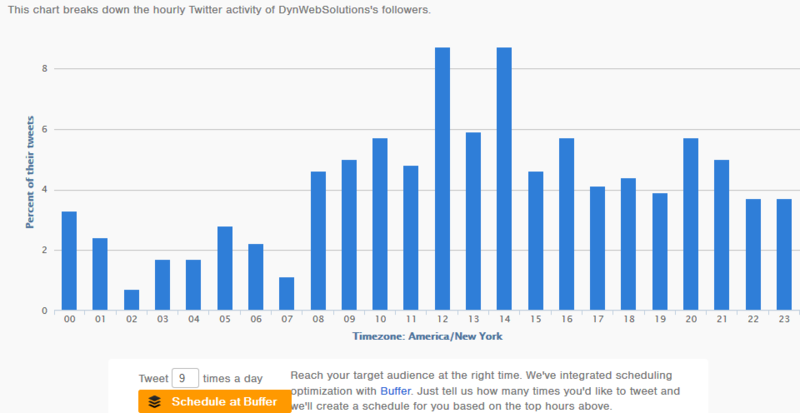 You can also link Followerwonk to Buffer, which will pick out the ideal times for you to tweet your content. Concerning our blog, the audience is most active on twitter at 12pm and 2pm, so if we want to get the best exposure for newly created content, we should create tweets during those hours. Even if you are at the same place your audience is at the same time, you still have to get potential readers to click the link. You don’t want to be one of those bloggers who hits publish and automatically shares your content across every possible social media channel with bland, unimaginative text and a link. Though some new, increasingly sophisticated social media automation tools might make this process much easier and your headlines much more alluring. If you put in the extra time to create an enticing headline for your blog, then you already have your first tweet for promoting your blog post (just use the title). For the subsequent promotions of your piece of content, try the top 3-5 entries from that initial list of 25. If you are looking for more twitter tips, Buffer has an incredible Scientific Guide to Writing Great Tweets. Is this going to take time? Yes. But you will never build an audience if you don’t put in the extra effort, especially when your competitors will. Do yourself a favor and give your tweets the absolute best chance possible for them to actually be read and, more importantly, clicked upon by creating twitter cards for your tweets. Makes you want to click, doesn’t it? 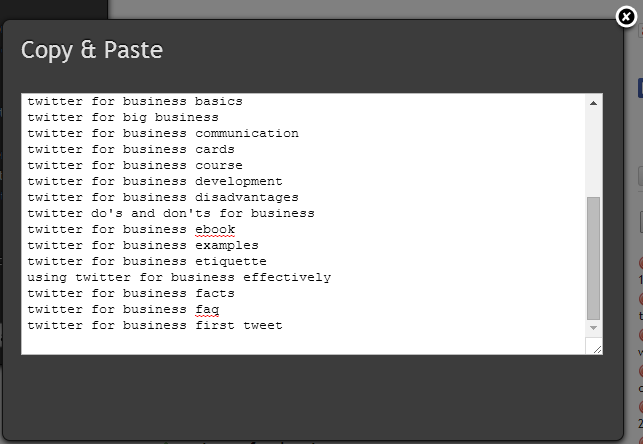 For a quick way to implement twitter cards, you can use Yoast’s SEO plugin, which sets the default to the Summary card. Don’t forget to take advantage of other visualizations! I think one of my favorite creative ways to increase blog traffic is to use a Vine video to create a quick teaser for your post. Since you are creating cornerstone, high quality content, you can reap the benefits of resharing this content. You shouldn’t give it just one push after publishling and then neglect it. Guy Kawasaki has his own system called “Guy’s Repeating Automated Tweet Engine” which posts tweets four times, eight hours apart. Republishing your content allows you to drive more traffic by hitting multiple time zones, and increasing the chance that other people will see your content. @Henely Wing, conducted a review of 100 million articles to answer the question of why content goes viral and uncovered compelling evidence for republishing content. The folks at Buffer are quick to note that blog posts that only got Retweeted a couple of times on average when first shared only got a couple of Retweets the second time. Want to ensure you only reach out to people who might be interested in your content? You can accomplish this by using Open Site Explorer. Using the two URLs from my internal linking examples, I’m flushed with outreach opportunities. Moz received links from 270 domains, and Goinswriter.com acquired links from 16 unique domains. Falling back on some of the industry research I did earlier, I can also uncover even more opportunities. I pulled the SEMRush research and filtered for the word “blog.” This uncovers a host of blog posts related to increasing traffic for a blog, or blogging best practices, probably all good people to reach out to for this post. Next, start to add these URLs into Open Site Explorer. You can see that we have uncovered an additional 31 opportunities which we can investigate. How Do You Increase Traffic to Your Blog? Following these steps might seem excessive, but you will be rewarded with increases in blog traffic and an active engaged audience. I’m always looking for ways to refine or reduce steps to take before and after publishing a new post. If you have any tips for driving more traffic to your blog, I’d love to hear about them!